As I have been suggesting throughout my build, I have plans to do a longitudinal arrangement for the drive line and the chassis extension has been a part of this development from the beginning. There are very few transmissions that exist that are suitable for such an arrangement. It became quite evident that the most likely candidate was the Audi 01E gearbox. The unit pictured below is the FWD version as opposed to the Quattro all wheel drive unit. When I started researching this gearbox, I became aware that this particular piece of engineering, the fwd drive version, has never been used in North American. That includes use by Audi and VW and trust me, there seems to be no shortage of information online that suggests it was used. Thus the search was on to find a source for a unit in reasonably good shape. All roads lead me to one source, Advanced Automotion in Corpus Christi TX. After making initial contact with the owner, Scott DeWitt, he was more that happy to educate me on the models available, the differences and the options to consider. There are two (2) models available, the Wide Ratio and the Close Ratio. The difference obviously is related to the gearing and the Advanced Automotion website clearly states what options are available for each set up. 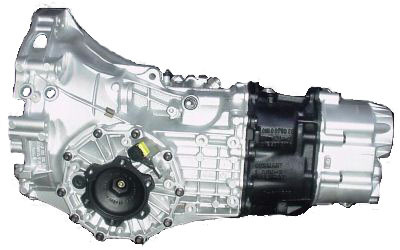 Before I go into this any further, here is an image of the 01E fwd gearbox. As you can see, the output shafts are located just behind the bell housing, making it well suited for a mid engine longitudinal driveline arrangement. 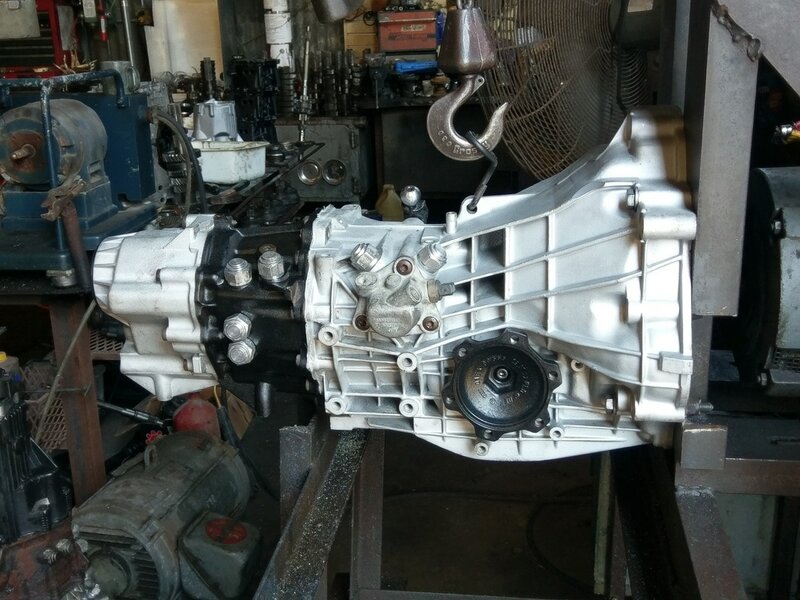 After discussing the availability of 01E's with Scott at Advanced Automotion and my local engine gurus, Dave and Sam, I made the decision to purchase the 01E Wide ratio gearbox. I also decided to include the option for a Wavetrac differential which Scott will install during his refurbishing work. The Wavetrac (above right) is an interesting piece of engineering and I highly recommend checking out their website. They have a great animation of its operation. I am hopeful that this will be well worth the extra cash when it's all said and done and running the back roads of Nova Scotia. Special thanks to Dave who ran the gearing specs through a custom spreadsheet that gave me the confidence to select the wide ratio model. As well, thanks to Sam who has been building hotrods and dragsters for eons and had all the right questions to ask, pushing me to consider items that I never even knew were related to this subject. I feel confident that the 01E wide ratio is the right choice for my project and I look forward to hearing from Scott regarding his progress. Here is a spreadsheet prepared by Bloozberry that compares the Audi 01E 6 speed Close ratio gearbox to the Wide ratio gearbox. 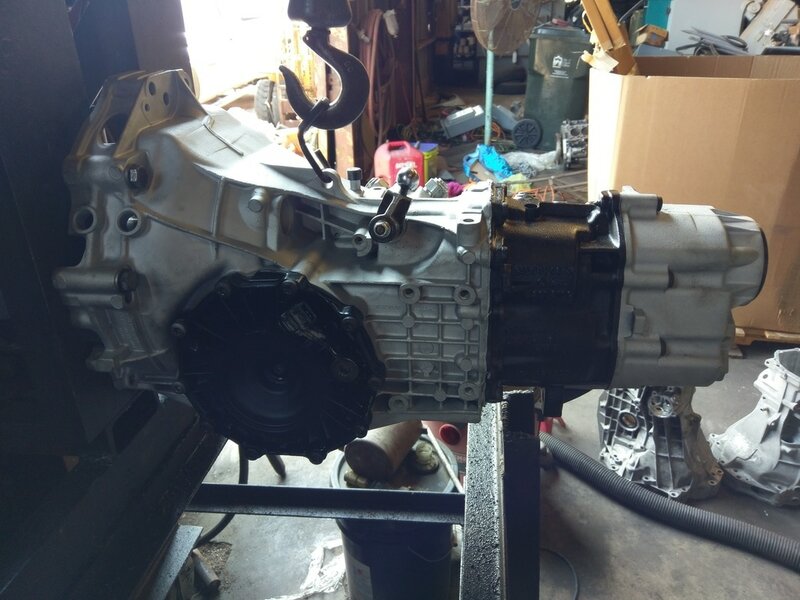 Dave also added the F40 6 speed gearbox that he is using in his project car coupled to a Northstar. Well look what arrived today at our loading dock. 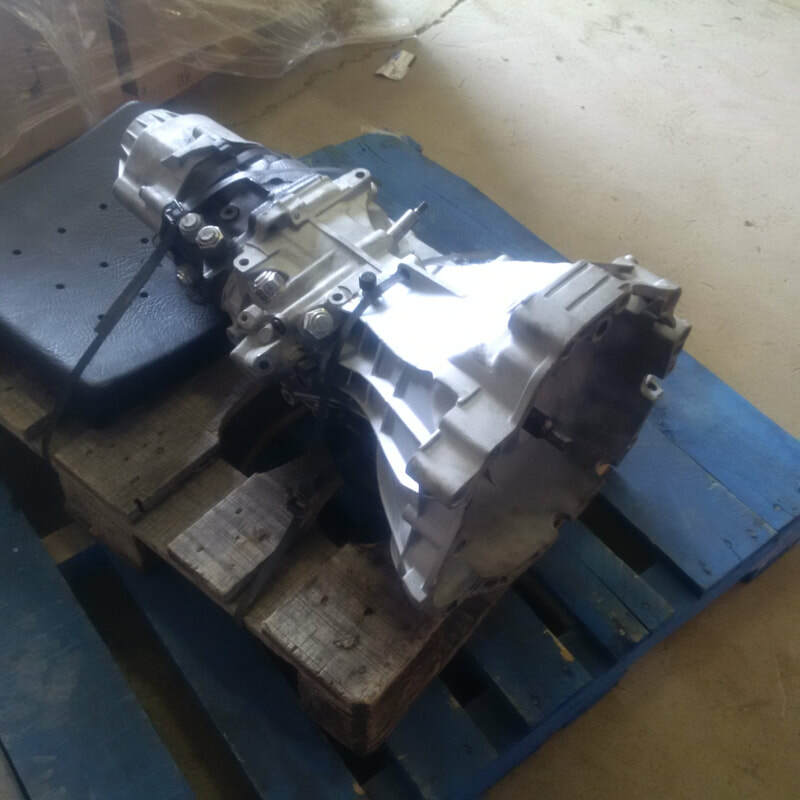 My 01E gearbox from Advanced Automotion has made the long journey from Corpus Christi TX all the way to Yarmouth, Nova Scotia. Huge thanks to Scott at Advanced Automotion for all his help with this purchase from selecting the model that best suited my project, to building the gearbox with the Wavetrac differential and then arranging shipping from his shop to my shop. All through the process, Scott kept me up to date on the progress through regular emails including pics during the build. Thanks again Scott for the awesome job. 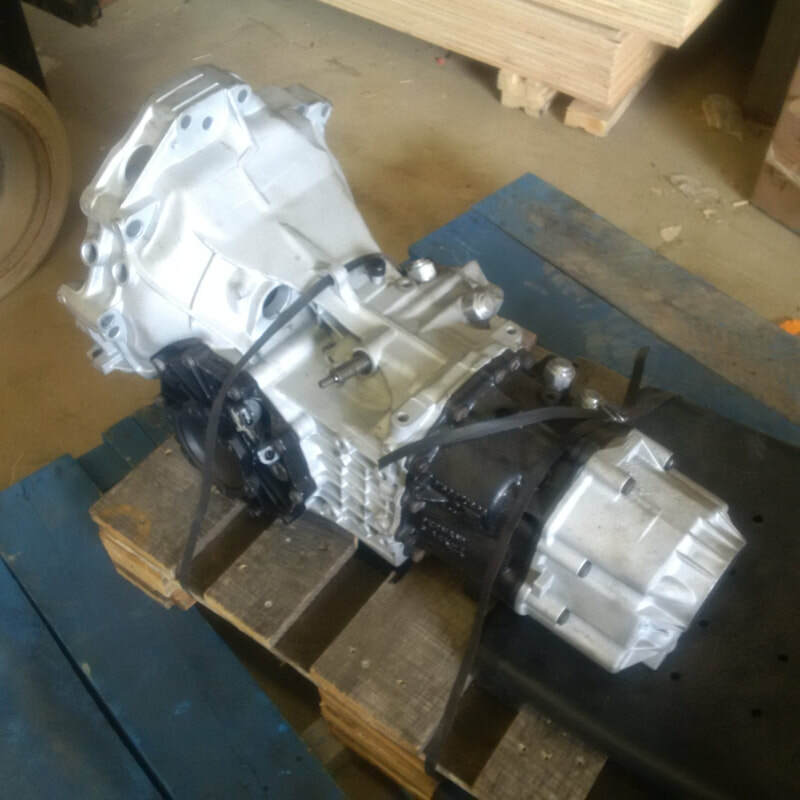 The gearbox looks great and I can hardly wait to get it sitting behind my LS3. Here is the gearbox sitting in the engine bay behind the LS3. I have the engine roughly in position behind the firewall but still about 1" lower that desired as well as angled downward slightly. The gearbox is also about 5" lower than the final location due to the fact that I still have a temporary transverse frame connecting the ends of the lower frame rails. Now that I have both major components I can get to work to finalize the aluminum engine cradle. It will be a challenge to build the rear end of the cradle while crossing from side to side past the gearbox. I knew this was going to be difficult but now that I have what I need, I can set to work designing a solution. I also have to position the 355 rear body work that my friend Dave loaned me for mocking up the chassis. I sure hope that rear 355 bumper is going to cover up the end of the 01E gearbox. It's sticking out a wee bit farther than I had hoped. Is it too late to extend my chassis another 3 or 4 inches ?